This article contains facts and information about the life and times of the famous Native American Indian chief known as Looking Glass. The same qualities may have been what pushed him to decide sign the treaty and accept the government’s offer of relocating his people in a small reserve located in Idaho. Looking Glass maintained a neutral stance and his tribe lived in peace in their settlement. Looking Glass believed that the United States government was going to leave them alone, but that was where they were mistaken. The threat to their peace happened when General Oliver Howard received reports that Looking Glass had attacked American settlements. Looking Glass was outraged and joined Chief Joseph in the Nez Perce War (June - October 1877). His role was as war chief and his task was to lead the people on the tribe's doomed 1300-mile flight for freedom. He initially led the fleeing group of Nez Perce Indians and planned to regroup with their friends, the Mountain Crows, and arrange an attack on their opponents. The Native Indians stopped at Big Hole River and were attacked and routed by US troops led by Colonel John Gibbon. This battle caused Looking Glass to lose face among the tribesmen and for a few days he was excluded from the war councils. His initial plans of joining their allies failed when the Mountain Crows denied passage to their camp. This pushed them to join the Sioux instead at the Canadian border. Discover the vast selection of pictures on the subject of the tribes of Famous Native Americans such as Looking Glass. 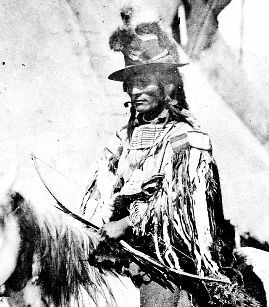 The pictures show the clothing, war paint, weapons and decorations of various Native Indian tribes, such as the Nez Perce tribe of Looking Glass, that can be used as a really useful educational resource for kids and children of all ages studying famous Native Americans such as Looking Glass. We hope you enjoy watching the video - just click and play - a great educational resource for kids.